Teachers are not feeling heard and/or supported by colleagues and administration. Designers identified a major reason they do not feel heard or supported is that they do not have strong relationships with certain colleagues or administration. Designers identified "relationship channels" they can leverage to build stronger relationships. For example, one designer asked a trusted colleague to set up a meeting that included the designer and the administrator. Teachers are not feeling supported by other team members. Designers identified a frustration with redundancy in their work. When a student is identified as needing additional support, regular ed and special ed teachers must document observations. These observations are not being shared and creating extra work for the special education team. 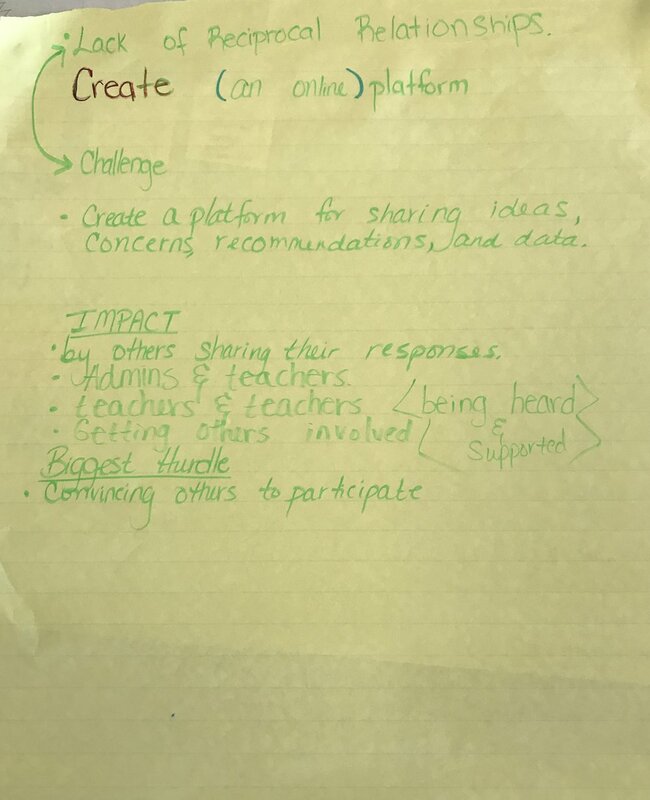 Designers created a plan for setting up an online collaborative notetaking area where student observations will be stored. This way, all members of the child study team have access to the data reducing the time it takes to collect observations, and increasing the group's understanding of the needs of the child.